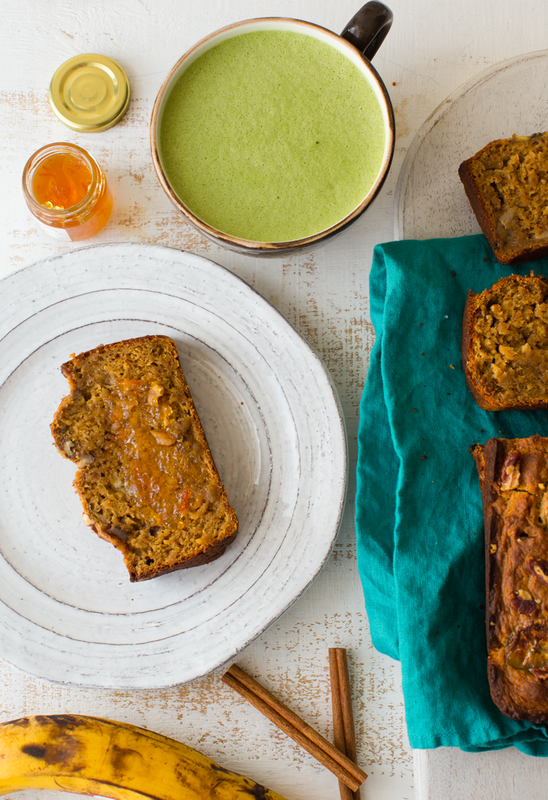 Magical is a good word for this loaf..
Today's vegan Holiday Banana Bread is a recipe that will get you through any busy December day.. Stressed out? Feeling crunched beneath a foot of invisible, metaphorical December snow? Super busy? 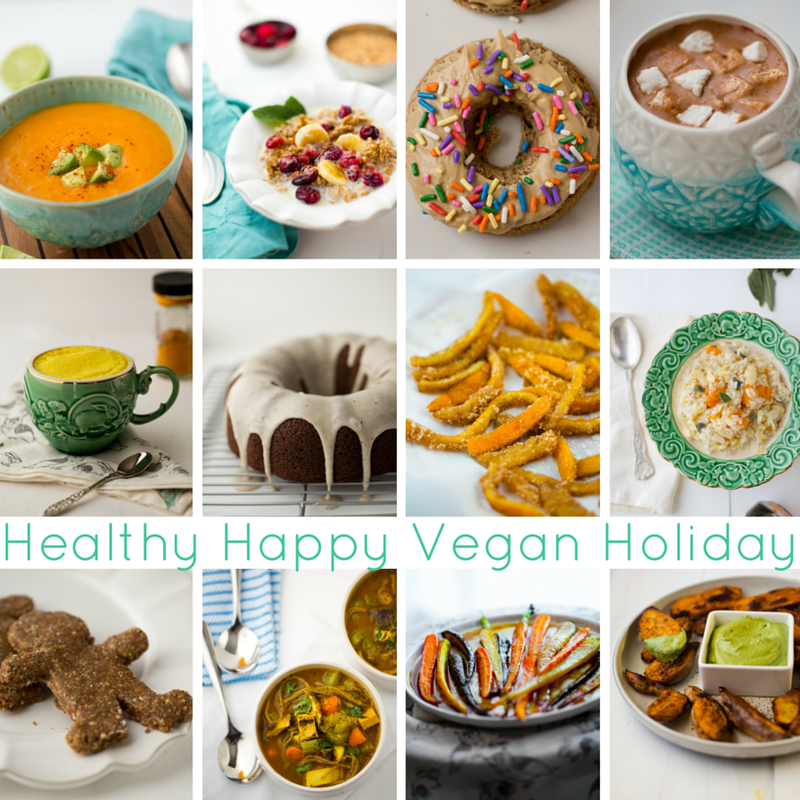 Feeling fatigued instead of festive? And even worse.. Are you tummy-grumbling hungry? 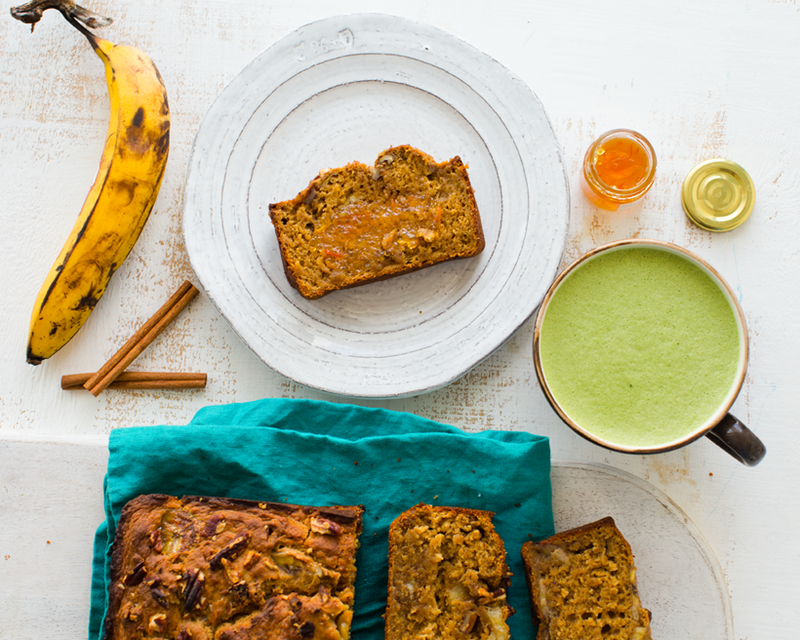 Grab a slice of this kinda-magical banana bread from the fridge! One bite and your tense, busy nerves will melt like marshmallows browning over a crackling winter fire. You'll feel like sugared snowflakes are dancing across your window as White Christmas and Jingle Bell Rock hum from your iPhone. 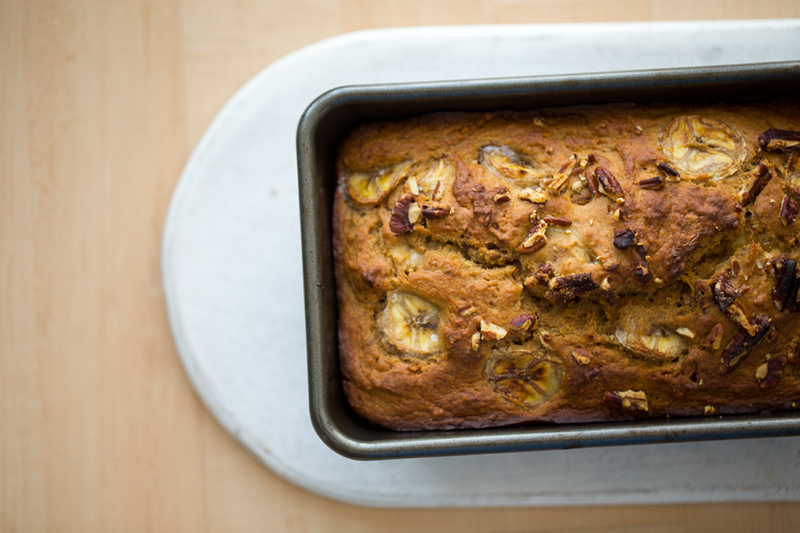 Yes, really, this banana bread does just that. Don't believe me? 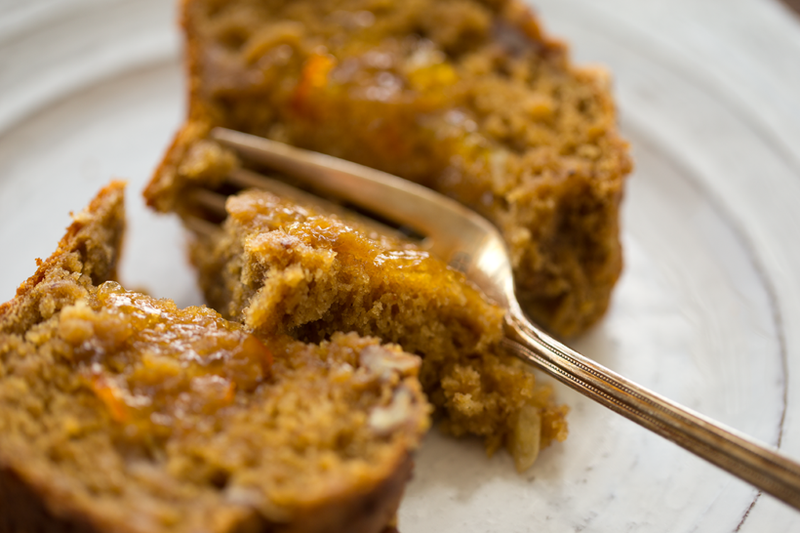 Take a crack at this recipe and you be the judge.. Fork slice into banana heaven. Orange marmalade on top. 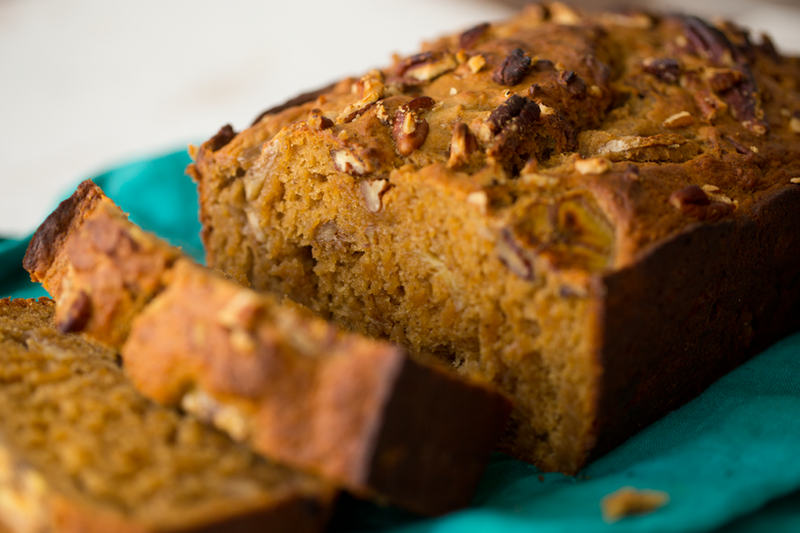 Here is a holiday spin on banana bread that turned out SO delicious! I added some holiday flavors like nutmeg, cinnamon, vanilla, molasses and citrus. 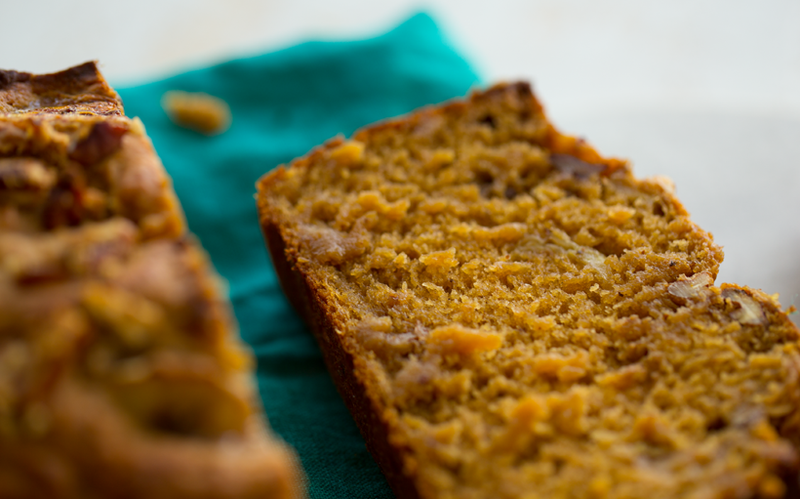 This loaf is super fluffy, hearty and sliced like a dream. I used vegan butter instead of coconut oil, which I usually bake with, and the difference is sublime. I think the bread chills a lot better without getting too hard in the fridge. Which means I could easily nibble on a slice straight from the fridge. 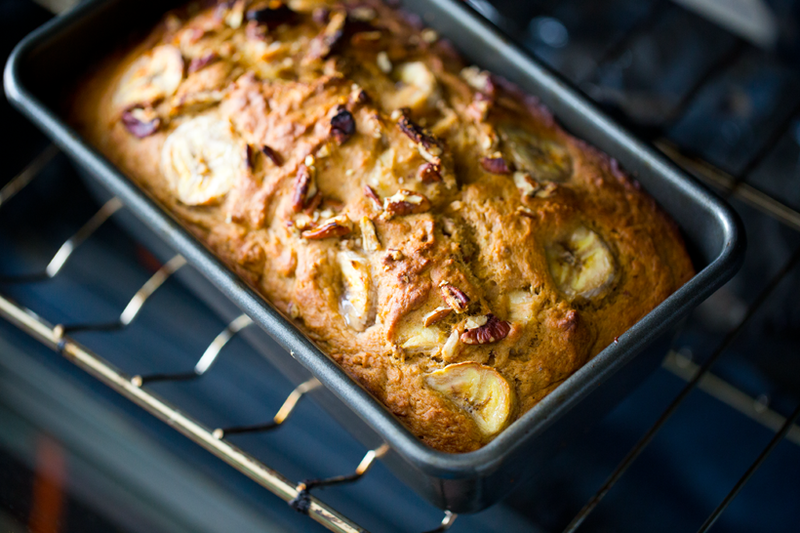 In love with this recipe so much I am going to make it again as soon as my bananas ripen enough! 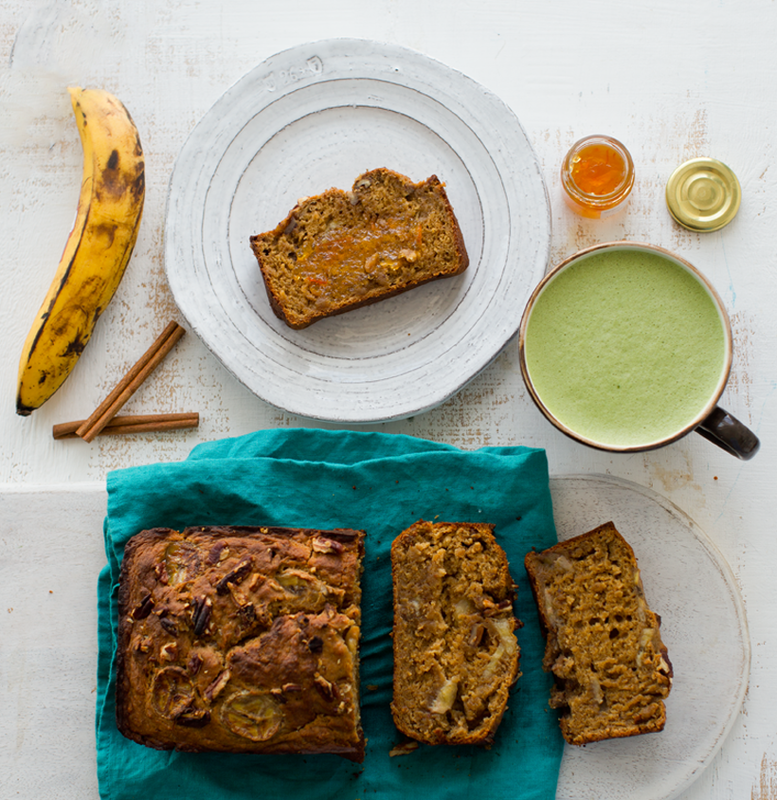 I love this bread thickly sliced and served with a matcha latte.. (have you downloaded my new matcha guide yet? A good read to pair with this snack).. 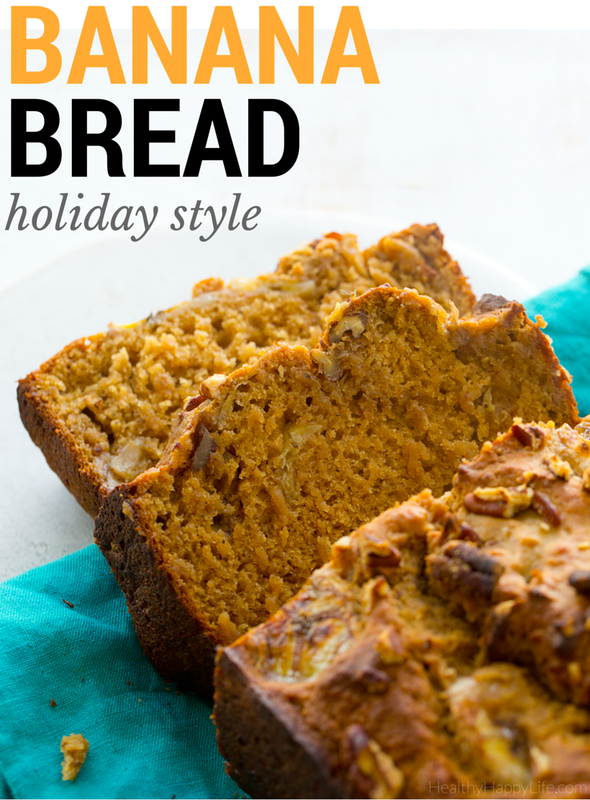 This would be a lovely snack to serve at a holiday party or gathering or on Christmas eve or morning. 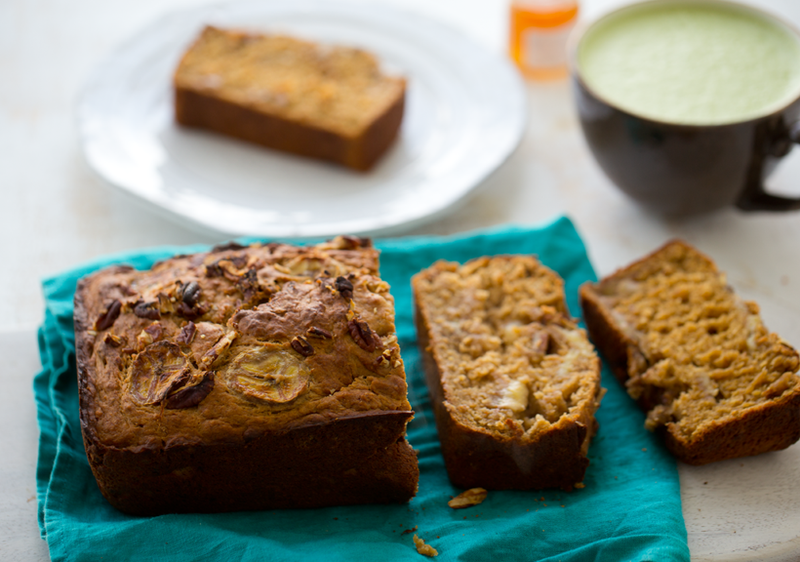 This vegan fluffy, holiday-spiced banana bread contains pecans, gingerbread flavors and load of bananas. Preheat oven to 400 degrees. 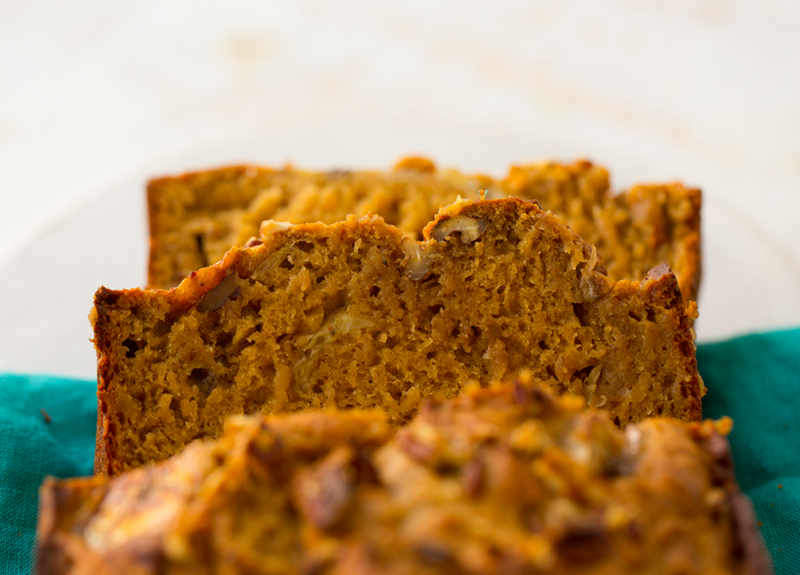 Grease a loaf baking pan with virgin coconut oil. Add all dry ingredients to a large mixing bowl. Stir to combine. In a blender or Vitamix, add all wet ingredients and blend until smooth. Pour the wet mixture into the dry bowl and stir to combine. Fold in sliced banana and pecans. Pour batter into loaf pan and bake for 40 minutes at 400 degrees -- or until a toothpick inserted in the center of the loaf comes out clean. Loaf will be slightly browned on top when done. 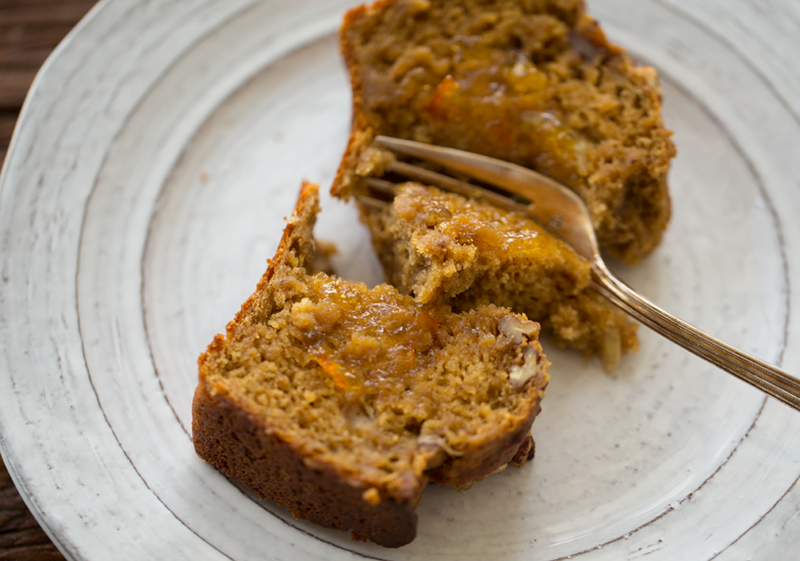 Store leftovers in the fridge -- this loaf is delicious warm or chilled.